A key ally of former Nigerian President Olusegun Obasanjo should never hold public office again, the Senate says. An investigation found 32bn naira ($217m, £138m) is missing from the accounts of the Federal Capital Territory which runs the capital Abuja. Former minister in charge of Abuja Nasir el-Rufai abused his office and must be made to account for the money, said the report by a Senate committee. Aides to Mr el-Rufai say he did not steal any money. He is also accused of abusing his office by selling a million-dollar house owned by the government to himself. The report by the senate follows weeks of public hearings. The missing money is the proceeds from the sale of thousands of government-owned houses in the capital. "We came to the inevitable conclusion that Nasir el-Rufai is not a fit and proper person to hold public office in a democratic set-up," the report said. His aide Goodluck Ebelo said neither Mr el-Rufai had "not enriched himself" while he was in office. Mr el-Rufai's administration also demolished thousands of houses and slums in Abuja, moving more than 800,000 people from their homes. 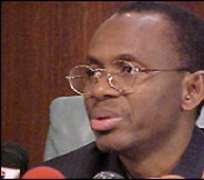 Mr el-Rufai was given the task of preventing Abuja becoming as chaotic as Nigeria's former capital Lagos, but his administration became very unpopular with residents. Mr el-Rufai has clashed with the senate before. He accused two senators of demanding a bribe before they would confirm him as minister. Four years ago he also called the Senate "fools". Mr el-Rufai is a close ally of former President Olusegun Obasanjo, who was replaced by Umaru Yar'Adua last year. Analysts said Mr Yar'Adua was handpicked by Mr Obasanjo to succeed him but the new administration has set up numerous investigations into the dealings of Mr Obasanjo's government.